When I walked out the door after work on Thursday, about 5:50 p.m., it was still bright, beautiful evening sky shot with pinks and the sun still slightly above the Coast Range peaks. Sitting here this morning at 6:30 a.m., the eastern sky is light. Listening to the morning train whistling through town, I feel winter receding. I feel I traversed the passage of the dark. 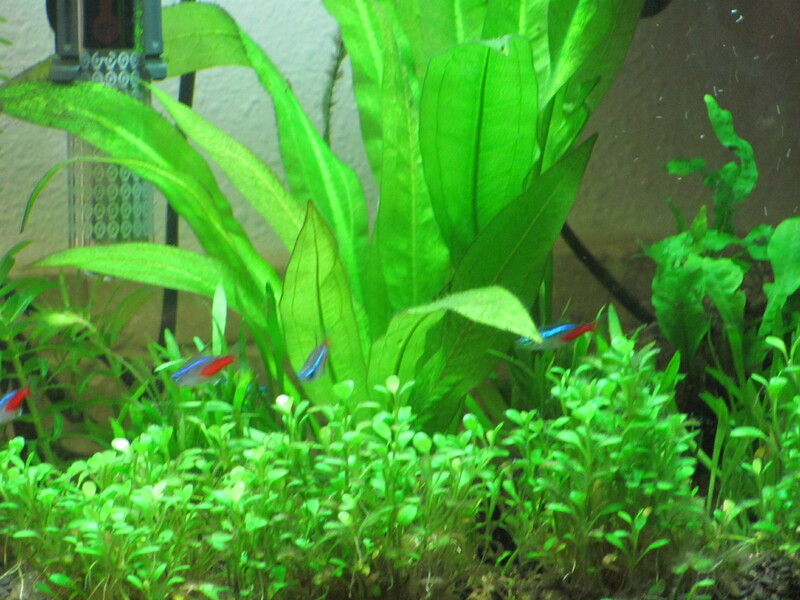 A month ago, the cube garden was a disaster, overrun with a stubborn algae the otos couldn’t keep up with and rotting fish food because I hadn’t yet figured out how much the neon tetras were eating. Cleaned it out. Cut out the plants that were algae-choked, replanted with micro sword and glossostigma, recharged the DIY CO2 and moved the whole system back into the kitchen where it won’t be neglected. Now it’s positively glowing. Seven gallons of planted tank heaven. I love this little set-up because it’s my first aquarium, purchased almost three years ago. Beautiful, simple (well, complicated but in a good way) and makes me happy. The otocinclus (dwarf suckermouth catfish, nine of them) and the plecostomus (a solitary albino) went into the tank on Saturday. By Monday morning most of the algae had been eaten. Wow, you guys. Nice work. 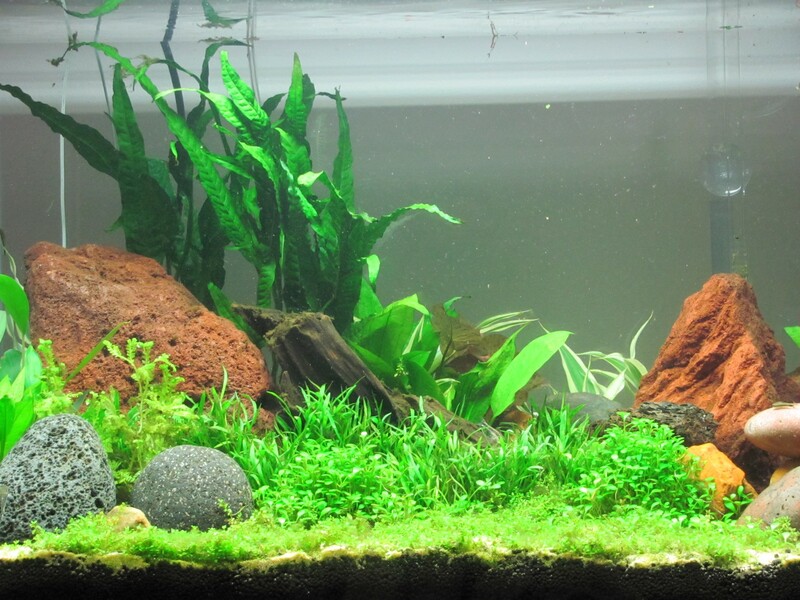 When you set up a heavily planted aquarium with everything that life loves — oxygen, carbon dioxide, nutrients, etc. — you should not be surprised that the very first thing that comes to call is algae. 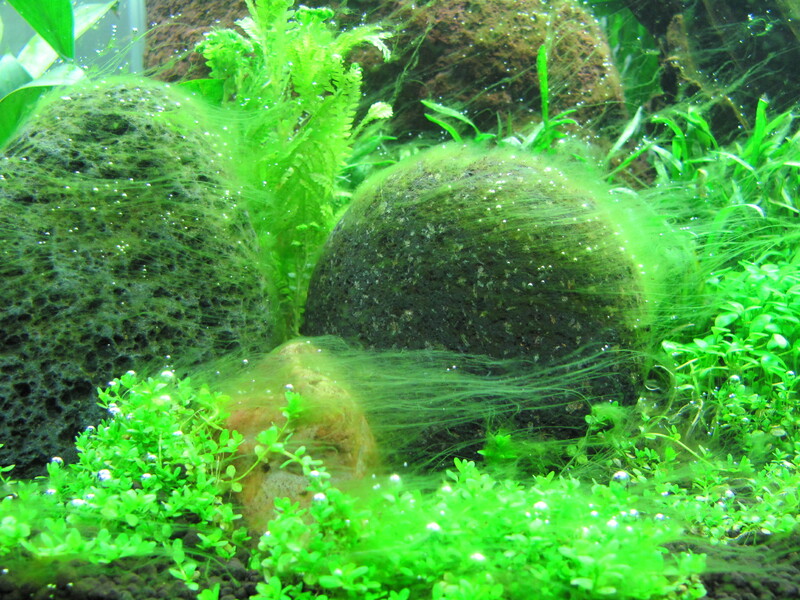 Here’s the algae in my new 40-gallon planted tank a mere two weeks after set up. I held off adding fish that would munch the algae because the specialty soil I selected is off-gassing ammonia that will kill fish and my filter system doesn’t yet have the beneficial bacteria established that will break down the ammonia. Patience is a virtue. Technical detail: yes, it is true, that lower PH with temps in the 75-77 degree Farhenheit range render the ammonia mostly harmless, but I don’t have a trustworthy thermometer yet and don’t want to needlessly risk fish. My good and wise friend Liz Engstrom has got me thinking about where I stand when I look at my world. Perhaps because I’m myopic and can’t see much at all beyond about one foot from my nose, I’m very into what’s in the room with me, what I can understand based on what I see within a narrow radius. Liz takes the broader view. She has an eye for pattern across the broad terrain. I suspect that for change to happen, somebody must be operating from that broader perspective. She is a change agent. I am an observer. I can’t help but feel that together we are something important. Whaddaya mean I need a plan? In a burst of hopeful enthusiasm that befalls me every January, I decided to name the year 2012 as the year of finishing. I thought it would help me get stuff done. But I cleverly didn’t specify what I would be finishing in 2012, and now here I am halfway through February and I have finished nothing in particular. So I guess if I’m going to finish something, I’d better make a dang list. OK. There’s my starter list. Now I just need a schedule. But first, I must nap. 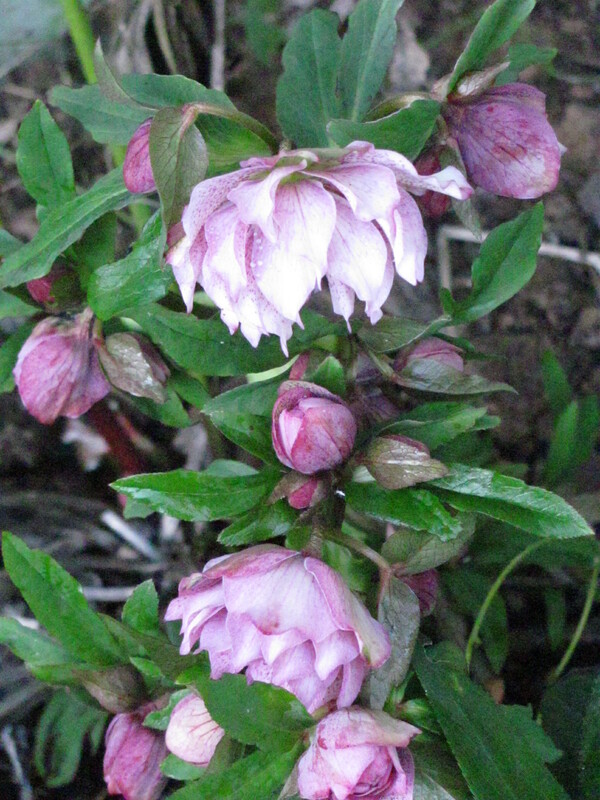 I planted hellebore to see something blooming in the garden in February. This little guy fills the bill. And any day now, the daphne with its tiny intoxicating blossoms will kick in, too, and I will suddenly want to be outdoors again. Having grown up in places where winter covers everything with snow and blooming things disappear from sight for months, I still can’t believe my good fortune to have my way to Oregon. I’ll take the winter rain, thanks. If you save the dishes until later because the now of dish washing is a drag, the later of dish washing will be even worse because you will be rushing to get them done half an hour before your friends arrive at the door and you want those friends to think you are not the sort of person who leaves the dishes undone. So that later will be all stressed and anticipating the future stress, you make now less fun because you’d rather be vegetating to an old “Doctor Who” episode than washing dishes. This whole business of living in the moment is fraught. Writing badly is easy. You just open up the mental spigot and words flow out of your fingertips and pretty soon you’ve filled a bunch of pages. Writing well is hard. You open up the mental spigot and words flow out of your fingertips and pretty soon you’ve filled a bunch of pages and then a couple of days later you re-read those pages and find two paragraphs worth keeping or two fine sentences worth sharing or the germ of an idea worth developing. And if, heaven forfend, you are trying to craft a novel, then there should have been time on the front end where all you did was ponder plot and story and character, so that when you do sit down to begin writing, the architecture can sustain and direct the sentences and paragraphs poring out of your fingers. When I see people promoting the idea that a novel can be written in 30 days, I think to myself, yes, of course, you can open up the spigot and the words will surely flow. But a brain dump is not a work of art. All of which is my way of reminding myself to be patient. I can’t push this river.